Clavia are as well known for their instruments' red livery as they are for the quality of their virtual analogue synths. 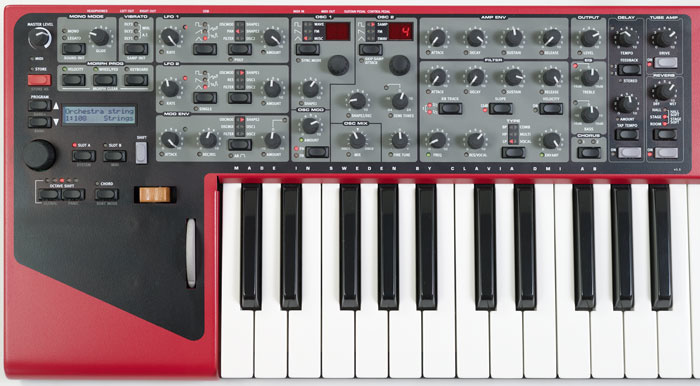 The new Nord Wave has definitely got the colour scheme, but can it live up to the sonic reputation of its forebears? With its distinctive appearance and mould-breaking return to the immediacy and sound of analogue, the Nord Lead set a high standard when it appeared back in 1995. The series spawned three distinct hardware incarnations, plus the revamped (and still current) Nord Lead 2X. Now, some seven years after the Nord Lead 3, we see its logical successor. You'll be pleased to hear Clavia have finally acknowledged built-in effects as a good idea, but it is the inclusion of sample playback that marks an entirely new direction — and a new name! Ladies and gentlemen, let me introduce the Nord Wave: a keyboard that combines the essence of the Nord Lead with a hearty chunk of quick-booting sample RAM. Other than the text printed boldly on the panel, there aren't many visual clues to this move into fresh territory. There's a much-needed LCD, so you can name your patches — as on the Nord Lead 3. However, the LED-ringed encoders that set that synth apart from its siblings have been retired (like the Nord Lead 3 itself) in favour of a return to the original style of knobs. Rather than wallow in elaborate comparisons with previous models, let's just pitch in, making them whenever necessary. The Nord Wave is first and foremost a performance instrument. Its 18 notes of polyphony are fine for most lead roles and the added bonus of two 'slots' (A & B) available to each patch, is an effective means of layering different sounds or quickly switching between two related sounds. Think of each slot as a self-contained patch that includes all the parameters that have a grey background on the panel. Each slot thus has unique EQ and chorus settings, but not reverb, delay and tube simulation, which are global. This system has served Clavia well in the past, but whereas previous Nord Leads featured four slots, the Nord Wave has just two, both of which share the single stereo audio output. The Nord Wave's generous patch library urges you to spread out and experiment. There are eight banks of 128 patches, making a massive total of 1024 which is, in effect, doubled if both slots are used. It's never difficult to find your way around, either: the use of categories and alphabetical sorting can greatly minimise the time spent searching through the banks. Only three of these banks are initially populated, and they feature prime examples of the factory string, choir and organ samples, as well as acoustic and electric pianos, basses, and a smattering of pads, leads and wibbly noises. If anything, it's analogue-type voices that are thinnest on the ground, but a few hours of knob-twiddling revealed the Nord Wave to be as adept in this department as the Nord Lead 2x. Indeed, the Wave's tone seems closer to that synth than the more blatantly digital Nord Lead 3. As is often the case, I didn't receive a manual with the review model. After skimming the on-line version and sitting with the synth for five minutes, I realised it wasn't going to be necessary. Clavia's ethos is to banish operational ambiguity as far as possible, so there's minimal menu-hopping, and everything is laid out before your eyes. Any buttons with alternate (shifted) functions have an associated LED to inform you when these are in use. Stripped down to the essentials: the rear panel of the Nord Wave, featuring MIDI In and Out, stereo audio outs, pedal connections, headphone socket and USB port for computer interfacing.Nord Wave synthesis consists of a familiar twin-oscillator section, LFO and ADSR envelope architecture with an additional two-stage modulation envelope, six different types of filter, a dual-band EQ and chorus. Keeping things compact, the keyboard is four octaves long and the whole instrument weighs only 6kg. Happily, Clavia have retained their wonderful and unique pitch-bender and also the thin modulation wheel, transposition buttons and chord memory. The last is nifty: you play a chord, which the synth memorises, assuming the first note is root. Chord memory then triggers up to three notes relative to every note you play which, with practice, becomes a slick performance trick. If you've followed any previous reviews of Clavia synths, you'll know about their system of 'morphing', a slick method of bringing patches alive via performance controllers. However, although the keyboard is capable of generating velocity and aftertouch data, I was disappointed to find that aftertouch is not available as a morph source. The Nord Lead 3 could exploit aftertouch as a morph source, so why not the new kid on the block too? I wonder if this omission reflects a lack of confidence in the keyboard action, as the aftertouch response is a tad stiff. There are three morph sources: velocity, keyboard position and mod wheel/control pedal, while aftertouch can only be routed to a fixed destination — vibrato. This is a rare menu-based parameter: an LFO devoted to pitch. On the subject of morphing, I should point out that a green LED associated with each 'morphable' control lights during morphing. It isn't as pretty or informative as the Nord Lead 3's implementation, but at least you can instantly tell which parameters are affected. Strangely, the transpose buttons affect any notes currently sounding unless you first enable 'Global Octave' mode, although I can't see why this is not the default behaviour. And if I was baffled by transposition, I was positively miffed to see that there's no arpeggiator! I particularly loved the Nord Lead 3's arpeggiator; it would have been a killer on the Wave, especially as a means of triggering sampled drums, basses and so on. There are a couple of further hints at a battle to keep costs down. The rear panel has MIDI In and Out but no Thru, whilst audio output is via a single stereo jack pair, shared by both patch 'slots'. Add control and sustain pedal inputs, a headphone socket and a USB port for sample and patch transfer and that's the rear panel covered. Clavia are rightly proud of their library of Mellotron samples. The Nord Wave arrives with over 160MB of its RAM ready-populated with samples, many taken from the Mellotron collection (and it still boots in less than 15 seconds!). At the time of writing, the free Mellotron library on Clavia's web site weighs in at over 250MB and features classic strings, choirs, brass and many more. Whilst these samples are good — marvellous, in many cases — don't expect to find every single note sampled, as would be required to exactly mimic a Mellotron. However, what you do get sounds authentic enough and is audibly superior to similar samples in my Emu Vintage Keys and Roland JV2080. And don't forget, having this library is just the start. You can do what original Mellotron owners never could and put these other-worldly sounds through a quality analogue-type synthesizer. This alone might be reason enough to own a Nord Wave. I mentioned earlier that each patch functions like a two-part performance; you can even specify bi-timbral operation and control each slot from a separate MIDI channel. Curiously, though, there is no keyboard split function: active slots are always layered over the full range. Thus, should you wish to play one slot from the keyboard and sequence the other externally, you must first ensure that the externally controlled slot is set not to respond to keyboard input. For troubleshooting MIDI problems, the MIDI status LED flashes, with visibly shorter blips whenever incoming data fails to match any channel the Nord Wave is set to respond to. Very sweet. For editing operations, you must select a slot to tweak — there's no option to edit both simultaneously. I looked, but in vain, for a knob 'pass-thru' or 'catch' mode so that I could tweak one slot, then select and tweak the other without risk of audible parameter leaps. There is no patch-compare facility either, but as you can copy the contents of slots freely and there are lots of banks to fill, that's not so much of a drawback. Much of the Nord Wave's sonic versatility arises from two fully featured oscillators, only the second of which incorporates sample playback. It follows that to layer two samples necessitates use of both slots, with a corresponding halving of polyphony. Each oscillator features the expected modelled analogue waveforms and a decent FM implementation. An unlabelled encoder is situated beneath the waveform button, and depending on which waveform type is in use, allows you to choose from the range of waves, samples or FM algorithms on offer. In addition, oscillator one has a 'Misc' option. Currently this is a noise source, the Shape knob serving as a low-pass filter making the noise more pink and rumbly. Perhaps we can anticipate further additions to Misc in future, so that it's even more miscellaneous! When the square wave is selected, the Shape knob controls its pulse width, but choose any other waveform and nothing happens, which seems like an opportunity missed. The Nord Wave's Wave Manager software provides simple but effective non-destructive sample editing, and also handles various library tasks.Sticking with Oscillator 1 a little longer, its Wave option has 62 digital waveforms. The manual uses the term 'wavetable' to describe these, but don't expect this to equate to the Waldorf (or Access) meaning of the term. These waves are static, single-cycle jobbies, not open to having either their position in the table or their waveform modulated in any way I could deduce. Wave is still fun, though, with lots of buzzy, fuzzy and decidedly electronic noises ready for action. Both oscillators have a simple yet eminently usable FM section featuring 19 different two-operator FM algorithms. The Shape control adjusts FM amount and feedback simultaneously. This, although less flexible than it might be, produces a wide variety of FM tones with minimal effort. There is no sine wave in the oscillator section, but you can create one by setting oscillator type to FM and Shape to zero. 'Where would we be without the rich, grungy tones of oscillator sync? ', I hear you ask! Activate sync and a hidden oscillator pops into life, its frequency controlled by the Shape setting. You don't hear this directly, just its effect on Oscillator 1. This was where I particularly missed aftertouch as a morph source — I wanted to modulate the Shape parameter with pressure and I wanted it bad! Sync only works with the modelled analogue oscillators. When we turn to Oscillator 2 we finally encounter the trump card of the Nord Wave, the gene that makes it the black sheep of the Nord Lead family. Select the Samp option to gain access to a maximum of 99 user samples, either sourced from Clavia's library or from your own. Given that there is a whopping 180MB of Flash sample memory — that's right, it remains after power off — I felt that offering only 99 possible sample locations was pretty stingy. Assuming that the restriction isn't due to the two-character display used, perhaps a future OS upgrade can change this. As you turn the encoder, the sample number is incremented in the display and, helpfully, the sample name is also shown on the main LCD. 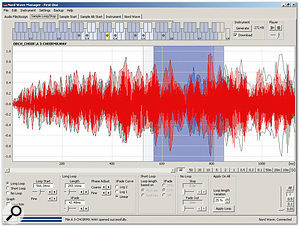 Samples are prepared in the supplied Wave Manager software and may be either mono or stereo. It's highly satisfying to dial up a lush stereo string patch, then give it the full Nord hands-on treatment. If hardware samplers had had a user interface like this, the species might still be flourishing today! We'll look at Wave Manager and the creation of user samples shortly, but in the pursuit of neatness, let's first round off the remaining oscillator features. Oscillator 2 has another new sound source: Swav. This is a subtly different digital waveform implementation; its waves are similar to those of Oscillator 1 but with the crucial difference that a short sample attack component is grafted on. With this in mind, Clavia chose more realistic waveforms for Oscillator 2. In conjunction, a decay control sets whether the waves will fade out over time. Either Swav or Samp waveforms are eligible for decay: combine either with a 'synthy' waveform from Oscillator 1 and voilà — realistic S&S-type synthesis! The 'Skip Sample Attack' button activates an alternate start point in the Samp or Swav wave. In the case of Samp you set this via the Wave Manager software; for Swav, the alternate start points are fixed, immediately post the attack component. Continuous control over sample start, as on the Korg ESX1, for example, would be better still. The last bottle in the oscillator spice rack is Osc Mod (Oscillator Modulation), which comes in two zingy flavours: Frequency Modulation and Phase Modulation. The former is capable of atonal, strident results, the latter sounds more like FM as Yamaha made it famous. Osc Mod turns Oscillator 2 into a modulation source for Oscillator 1 and does so for all oscillator types. If you set both oscillators to FM, more complex (four-operator) FM is possible. Clavia have programmed many different filter models over the years. The Nord Modular series and the Nord Lead 3 offered complex filter types that transcended the primal urge to be 'Moogish'. In the Nord Wave, just six different types have been chosen, each with an alternate personality courtesy of the 12dB or 24dB slope switch. Even though there is but one low-pass filter model, it's a cracker, perfectly suited to analogue synth mimicry. The Comb filter offers anything from gentle phasing to almost sync-like tones. It is less ringing and metallic than some comb filters, but in a synth where controllability and musicality score higher than warped freakishness, this makes perfect sense. Switching to the Multi setting, we obtain a filter with three resonant peaks. The distance between the peaks is fixed, with the centre frequency set by the cutoff, and resonance controlling the overall depth. This filter produces a rich, electronic overlay to any oscillator source, and is capable of turning a sampled string ensemble into an ethereal mush in seconds. Speaking of ethereal mush, the Vocal filter is my personal favourite after the low-pass. It employs two resonant peaks which can be manipulated to resemble vowel sounds. The resonance control varies the distance between the peaks, and cutoff frequency applies a shift, which can be quite dramatic over its full range. I was able to generate some beautifully expressive choir patches using the morph function with this filter: I set velocity to raise the cutoff frequency whilst the mod wheel swept the resonance. As with the Comb and Multi filters, you must set resonance to anything above zero to hear any effect. Finally, keyboard tracking of the filter is available via a button, with four discrete options from zero to full tracking. Another button maps velocity directly to filter envelope amount. As a long-term advocate of onboard effects, especially for their convenience in live situations, I'm very happy to see them make an appearance here. Each slot has unique chorus and EQ settings. The delay, reverb and a tube amplifier simulation are global, affecting both slots equally. The two-stage equaliser offers ±15dB boost or attenuation and has fixed frequencies of 4kHz and 100Hz for treble and bass. EQ can make a tremendous difference to a synth and does so here, the high end being particularly well suited to airy strings. If you set the gain to anything other than zero, a red LED lights to tell you. The stereo chorus is every bit as good as that of my old Roland Juno 6, ranging from slow and deliciously swirly — like a languidly stirred cappuccino — to lightly fuzzy and warm. The third, combined setting is so rich it could lead to unseemly rumbles if taken late in the evening. A lush yet usable ensemble. Turning to the delay, we see that its time is set either via a knob or by the tap tempo button. Its range is between 64ms and 2.26s, and either mono or stereo modes are on offer. Unfortunately there is no MIDI sync option, although the tap tempo button is a substitute of sorts. For sequenced stuff I'd have liked MIDI sync — and I suspect I'm not alone. The delay's feedback has just four settings, ranging from one repeat to near-looping. This is another case where a continuous control would have been superior, as 'playing' the delay feedback is an integral part of many vintage synth performances. As there seems plenty of free panel space left, it's a pity that one more knob couldn't have been added. Still, I shouldn't complain too much: at least it does have a delay, it is easy to use and sounds good. Moving on, the reverb is a pleasant encounter, with simplicity the order of the day. Five reverb types are provided; there are room, stage and hall simulations, the stage and hall having bright or mellow personalities. A single Amount knob is the only control available, but fortunately, each 'verb sounds good enough to use 'as is' — it could certainly save you an effects box on stage. If the reverb is a simple affair, it's in the Profumo league compared to the Tube Amp effect. With just on/off and Amount settings, this simulation of a tube amplifier adds big, hairy, swinging attitude to synth solos and basses. Used sparingly, it instils a lovely yet warm presence, but I felt it maybe got a bit too much, too soon on the dial. The global nature of these effects is something you can live with, but is most limiting in the case of the Tube Amp, which would be ideal on a distorted solo but would wreck anything mellow layered with it. I've deliberately left the software component of this review until last, not least because the Nord Wave is an instrument designed to be played rather than moused around with. Despite being someone who prefers to keep music-playing and computer operation far apart, I had previously been impressed by the no-nonsense software for Clavia's Modular synths, and I was quickly won over by Wave Manager. Indeed, once you accept that it's logical to keep all computery stuff out of the synth, why not put it where your sample libraries (probably) reside! The system requirements are a PC running XP or Vista, with a minimum of 512MB of RAM. For a Mac, 512MB is needed too, along with OS 10.4 or later. 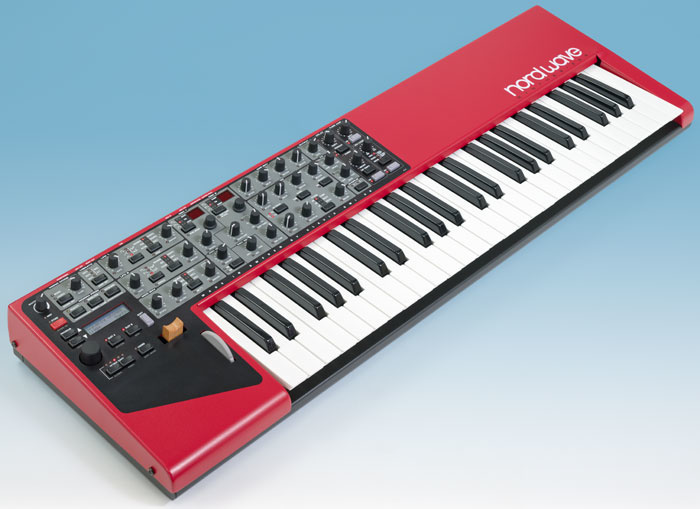 As a punter rather than a reviewer, you'll probably get a DVD with your Nord Wave, so you'll need a DVD drive and, of course, a USB port to connect to the synth. 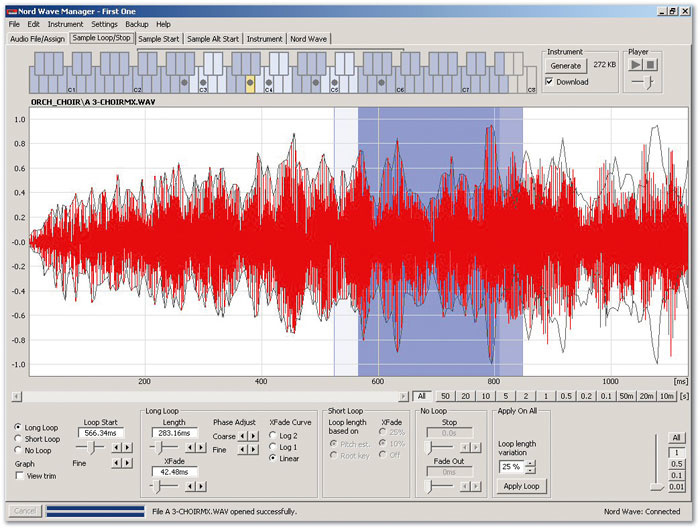 Having installed software and drivers, the important concept to grasp right away is that each project created in Wave Manager is your means of generating a new sample-based 'instrument'. A mere 99 of these instruments can be stored in the Nord Wave's 180MB of flash RAM. You can choose to have instruments uploaded automatically when created, and if you do so, it's crucial to begin a new project when you load a fresh batch of samples: changing the samples but keeping the project name the same will mean the original being overwritten. This is one area where a printed manual might have been good after all, especially as the program does not feature built-in help. The Nord Wave's front panel embodies Clavia's pleasing 'physical controls whenever possible' philosophy.There are several ways to assign user samples when you create a new instrument. The editor can recognise the key or note number when it forms part of the sample's name — FluteC3 or Piano_44, for example — and can automatically map these onto the appropriate keys. This is one of several time-saving features. Alternatively, the editor will extract multiple samples from within a single WAV file. Specify the note interval between samples and the threshold level at which a sample is considered to have ended, and let it work its magic. At any time you can manually change a sample's root note and upper key limit, and since an instrument may have up to 91 non-overlapping zones that's 91 different samples. If you use so many, you'll certainly need those transpose buttons! Think of an instrument as a conventional multisample in which samples can be freely mixed, whether looped or non-looped, chromatically tuned or at constant pitch across the keyboard. Effortlessly, I assembled a bunch of drum loops over a short range of keys, a bass over a couple of octaves and a solo flute higher up. USB transfer to the Nord Wave happened without me even needing to think about it. Editing is non-destructive, which is what you want to hear, given the likely importance of your sample collection! Stereo or mono WAVs at up to 24-bit are supported, and their loop information is recognised. And although Wave Manager doesn't attempt to replace your existing audio editor, its crossfade looping implemention is quite effective and could prove sufficient for most applications. As you play notes on the keyboard, you can see on screen which samples will be triggered; you can audition them via your computer's soundcard, set the alternate start position of a sample, modify the gain and tuning of individual samples, transpose the whole thing and more. You needn't even be connected to a Nord Wave, so can assemble projects off-line for later upload. Naturally, the software also serves as a librarian for individual patches, banks or samples, and supports intuitive dragging and dropping of its various file types. It does take a while to back up the entire Wave across USB — about eight minutes — but 180MB is a decent amount of Flash RAM, especially when you take into account the lossless compression algorithm Clavia have developed to reduce sample sizes by up to a third. Management of available sample memory is mostly seamless; a bar shows used space, free space and space yet to be deleted from RAM. My only problem arose after purging several megabytes of wholly unnecessary accordions. When I attempted to return this liberated space to the fold, the synth and software simply hung on me. A quick email to Clavia prompted me to install a brand new OS (1.08), fixing this very issue. Sorted! I've approached this review as if the Nord Wave was simply the latest Nord Lead. I accept it isn't called a Nord Lead, but it easily could be. It's my favourite of them to date! This is an elegant demonstration that a fair number of carefully chosen features is a viable alternative to the 'zillion possibilities, zillion hurdles' school of synthesizer design. The Nord Wave has evolved out of a very particular design mindset; it will either click with you, or not. A musical instrument should not be judged purely against a spreadsheet of feature lists and big numbers: it should feel right, being versatile, immediate and intuitive, so you are inspired to play it and keep playing. That said, however, I can't help it if I have high expectations of my hi-tech. I get greedy, especially when out of my preferred budget zone. So yes, I was disappointed that there's no arpeggiator. Or keyboard splits. And that the aftertouch implementation was so limited. To a lesser degree, I sulked a bit because MIDI sync was not available to the LFOs or the delay. However, I was glad to see effects included at long last, and very pleased that both the reverb and chorus sounded so good. I never once missed not being able to sample on the Nord Wave — surely this is what computers, screens and mice are for anyway? But that thing I said earlier about big numbers... well, since you can use samples, and since there's lots of memory to put them in, why oh why can only 99 instruments be loaded at once? I realise that each of these could potentially be a mighty multisampled monster, but there are times when you need to access hundreds of individual loops or one-shot samples without first organising them into multisamples, no matter how easy that is to do. Make no mistake, when you start to build your own instruments you really appreciate the Nord Wave's strengths. Not that the provided samples, the Mellotrons especially, are anything less than wonderful. But Nords are for programming and this one raises the bar in terms of the uniquely rich, organic tones it can produce. If it only possessed Ableton-like warping, for tempo control of loops, it could contain most of my live set! Hearing realistic pianos, strings and choirs alongside smoothly accessible modelled analogue sounds is no mere novelty. In fact the Nord Wave, as of today, is in a league of its own. The last time a new synth grabbed me quite this much was the Roland V-Synth, back in 2003, and that instrument is still the closest rival I can think of. Yet as the V-Synth can't create multisamples and its virtual analogue engine is way less convincing, they complement each other rather than covering the same ground. Somehow Clavia keep managing to leap ahead of the pack by creating these classic, simple-yet-powerful instruments. A winner. 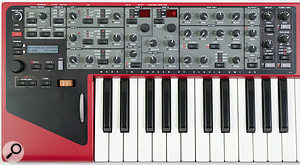 Great hands-on experience; the Nord Wave opens up the use of samples with synthesis like nothing else quite has. Very welcome addition of effects. The Nord sound taken to the next level. Only 99 sample memory slots. Aftertouch not a morph source, and only routable to vibrato. Only two parts and no split-keyboard functionality. A performance synth, not a multitimbral workhorse, the Nord Wave is basically a Nord Lead with the ability to play samples — but with a decent amount of RAM and a library of Mellotron samples to get you started, you can enjoy classic sounds from day one. By relegating the business of sample editing, multisample creation and looping to external software, Clavia have freed up the synth for the hands-on pleasures you earned by purchasing hardware.